Victor Floyd was the running mate to Sammie Smith at FSU. As a Sophomore, he led the team with 681 yards and 6 TDs. Injuries derailed what could’ve been a spectacular career for Floyd, but he still managed 5.8 yards per carry, 1,548 yards, and 12 TDs in his career. 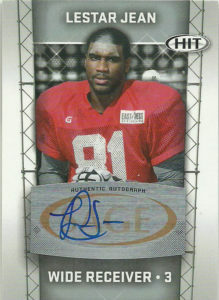 A member of the 1989 draft, Floyd was selected in the 11th round by the Chargers. He briefly saw playing time that year, rushing for 15 yards on 8 carries. 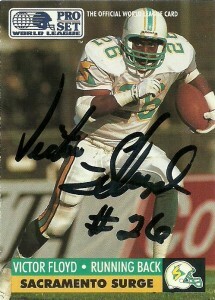 Victor was drafted in the 3rd round of the runningback portion of the WLAF draft in 1991. 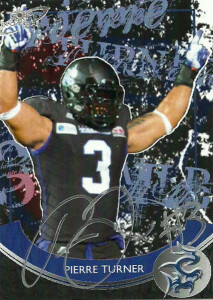 He did it all for the Surge leading the team in rushing with 406 yards and 2 TDs, and averaging 4.4 yards per carry. Victor also caught 13 passes out of the backfield, including a 60 yarder for a TD against Montreal. His best rushing game came against the Knights– a 102 yard 13 carry effort. Floyd also led the team in kickoff return average with 21 yards on 9 returns. 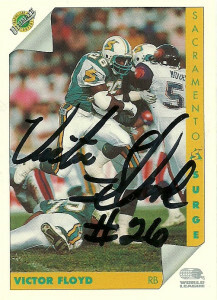 In 1992 the Surge was massively retooling their offense and allowed him to sign elsewhere. Possibly impressed by his performance against them, the Knights signed Floyd to the team’s runningback stable of Eric Wilkerson and Chris McLemore. He finished the season with 8 carries for 12 yards, and 6 catches for 166 yards and a 65 yard TD. 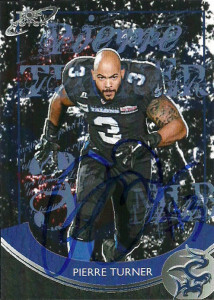 He then played for the Orlando Predators in the Arena Football League, before retiring. Victor has been coaching since then at the high school level. He’s held a variety of positions from basketball, track, and head football coach. He is currently an Algebra instructor and head football coach at Agape Christian Academy. Under his watch the school advanced to the playoffs for the first time in history.